sending its faint melody to dance on air. Is it a riddle? Not really. I’m sure it didn’t take too long to realize the topic of the poem is a wind chime. 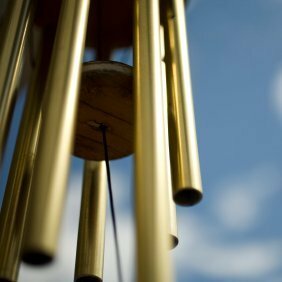 As a huge wind chime fan, I’m often captivated by its simple musical beauty. Yet, I know this beauty cannot be heard unless the wind blows — and the harder it blows the louder the song. A Christian’s greatest testimony is one of peace and trust. While we can separate ourselves from the world based on our don’ts — don’t drink, smoke, or chew, or go with those who do–, it is the a life lived in complete trust of God amid utter turmoil that sends people seeking after God. Those who have chosen to live life without a hope of knowing God “works all things together for good” will be intrigued when we live our lives in such a way that displays that truth. The song of our wind chime should be sweetest when the storms rage. If a wind chime rings the loudest when faced with harsh winds and still creates a melody, why can’t our lives do the same? If a wind chime twists and turns in the turbulence of the storm yet sings pure notes, shouldn’t our Christian life belt out the faithfulness of God amidst life’s storms? May we not only sing when the breeze blows gentle on our faces, but may we sing louder and clearer when the hurricanes rage. This entry was posted in Spiritual Encouragement on May 27, 2015 by aliciachall28.